My 55″ TV displays flashing and distorted colors on all channels. This happens even when the channel or volume overlays are on the screen. This issue did not slowly happen, it just happened overnight basically. I want to know what caused my TV to have this issue. I tried changing many of the internal TV settings with the original remote control in the color management settings. I changed and tried resetting the hue, contrast, brightness, and everything else. This did not work. I turned the TV off overnight to see if maybe it was a one time problem but this did not help. I even left it on for 24 hours and this did not help fix my TV. At times the TV screen is flashing red, green, and white over & over again. At times it flickers when nothing is going on is much brighter than it should be. Do you think there is a reset or do I need to replace a certain part? 1. The TV is in a “self test mode”. 2. Loose video input wires. 3. You have speakers near the TV that have magnets in them that are causing the screen to display incorrect colors. 4. Video input dirty or damaged. 5. The t-con board has gone out. To turn off self test mode, first stand near your TV’s power cord going into the wall. On your TV remote control, first press the arrow up button then the arrow down button. After pressing the remote buttons, unplug your TV from power within 5 seconds. Wait 15 seconds and plug the TV pack into the power outlet. Wait 10 more seconds and test the TV to see if the issue has been solved. If your TV is not working correctly still, repeat the complete procedure but press the left arrow button and the the right arrow button instead of the up and down buttons. This works on most TV’s, but you may need to go into the settings of your TV with the original remote control and turn SELF TEST MODE to off. Check all wires in the back of the TV to be sure all is tight. You may be using composite (component) cables that have a red, blue, and green wire for the video input. It also needs a red wire and a white wire for your left and right speakers for sound. It is possible these wires have come loose. Go to the back of your TV and push the wires in until they feel tight. Check the TV screen. Also check the back of the cable box or receiver and do the same thing. This may bring your colors back to normal. If you are using an other type of connection, do the same thing. If you have surround sound speakers near the TV screen, move the speakers away from the screen. The magnets in speakers will have a strange effect on your TV screen if the magnets are too close. Magnets will cause issues with the picture on your TV. Always keep magnets away from ALL TV screens. Check to see if the HDMI, coax cable, RGB, USB, Component or other video inputs ports are dirty or damaged. If there is excessive dirt or dust on a an HDMI cord and it is inserted into the TV, the picture and or colors of the TV may be affected. Unplug all video inputs and be sure there is not dirt, dust, or damage (split video cord, cracked coax cable wire, broken or loose input on TV) coming in between the input video line and the TV input. Unplug all the A/V wires in the back and plug them into different ports if needed to test certain inputs. Plug all inputs back in and test TV to see if the issue was simply a connection with dirt or dust causing your issue. You may have a t-con board that is going bad. You will need to disassemble the TV to fix this issue. It may or may not be worth it depending on the type and age of your TV. 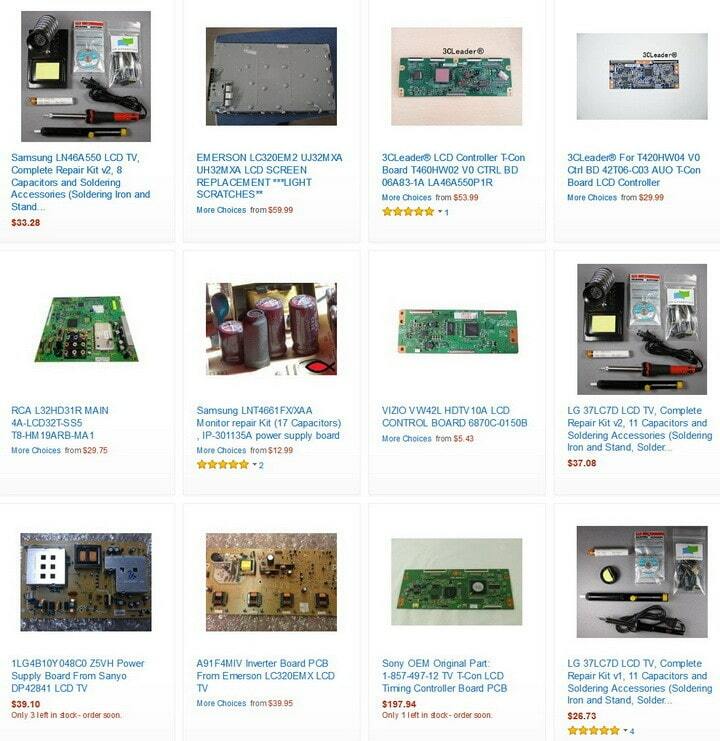 You can Google your TV make and model to find out if this is your exact problem. If you find that the t-con board is bad, replacing or fixing it is the only way to fix it. NOTE: Eliminate all possibilities before assuming it is the TV. Always check the connections, try a different cable and different input on your TV. 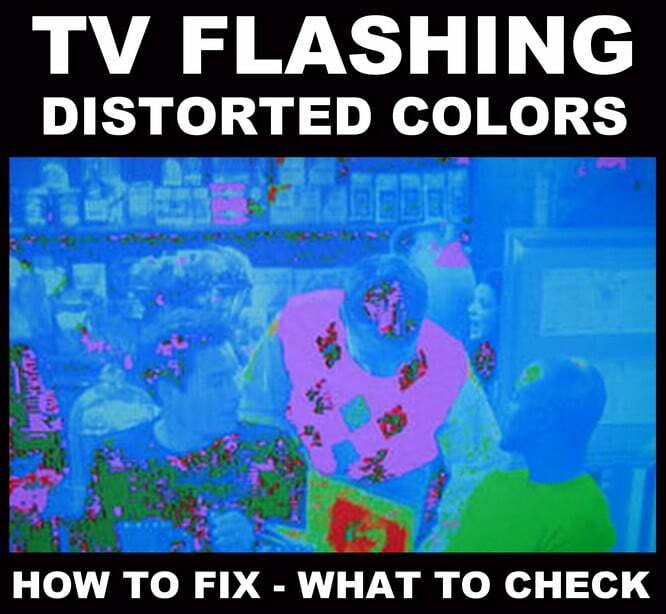 Do you have suggestions or experience with a TV displaying strange or weird flashing distorted colors and what you did to fix it? Please leave a comment below. My ceiling fan caused the screen to blink red, white, blue, green, and different shades of each color in the rainbow. The sound was fine but the picture was gone except the different colors blinking. I turned the set and cable box off and the fan was turned off too. I turned everything back on except the ceiling fan and the tv now works normally as it should. I think the magnetic field pulsating out from the fan influenced the functionality of the tv. The motor of the ceiling fan is less than 5 feet away from the tv. This started a while back, about a month or so, I’d turn the tv on with the ceiling fan and it would work fine for a while and then go into the blinking mode. It now works fine as long as the fan is not running. After a lot of time swapping out various components (cable box, HDMI integrator) and the HDMI cables themselves, I discovered that simply disconnecting and reconnecting the original HDMI cable that connects to the TV solved the problem. hi, I have 40 inch Samsung 3D smart TV, it is only 8 months old. in the beginning it started giving solorised images, but after one day now its giving all redish colour in the pic and the sound and tv programmes are ok, but all in red tone. Previous post: LG Refrigerator Water Filters – How Often To Replace Filter? Next post: Smoke Detector Is Beeping Chirping Every 30 Seconds? – How To Reset?